We are manufacturer and supplier masterys UPS. Our products are very good capacity of maintain the power. These products are made up good raw materials which was import from international level. 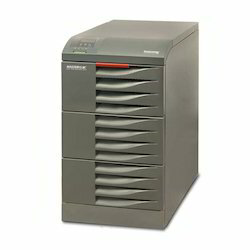 Available with us us a gamut of cost-effective Masterys MC UPS. Manufactured at technologically advanced infrastructure by a team of skilled professionals, these qualitative UPS are in no comparison with any. These high quality UPS provides great battery backup and helps enhancing the life of attached system. Working as a guard to protect from short circuit and high voltage, these UPS are highly demanded nationwide for outstanding features. We manufacture these qualitative product at very large scale and make them available in market at market leading prices. Designed to protect production processes and IT applications. Easy to handle (fitted wet castors). Unique to the market with its highly compact size. 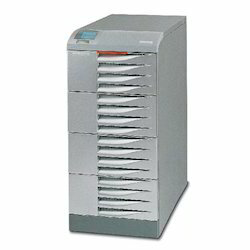 Can even be installed in existing 19" rack cabinets (up to 30 kVA). Flexible back-up times: different configurations are available either within the standard. UPS cabinet or by using taller UPS cabinets, without increasing floor space. Scalable power or availability (using redundancy) by placing up to 6 units in parallel. Harmonic distortion reduced (THDI < 3%) via use of an IGBT rectifier. Redundant batteries: the battery peeks are connected to each other h two distinct strings. if one battery pack in a string is not functioning, back-up time is still available from the remaining string. EXPERT BATTERY SYSTEM for battery management. ALWAYS ON MODE energy saving operation without upstream harmonic feedback. ENERGY SAVER power management in parallel configuration. GLOBAL SUPPLY SYSTEM generating set management. Protection against back feed on the upstream network (internal or external). Separate rectifier supply and bypass networks for 3/1 models. We are a coveted organization engaged in manufacturing, supplying, trading and distributing Masterys BC UPS. These UPS are widely appreciated for flawless performance and instant backup. Our manufactured products are highly reliable as they passes through various quality check process ensuring high quality. We manufacture these products using modern tools and updated technology, under the supervision of experts professionals. These products are available at economical price for our valued patrons. Well suited for sensitive professional applications. Suitable for protection in IT environments due to the scope of the back-up time and the possibility of installation in 19” rack cabinets. Easy to handle (fitted with castors). Can even be installed in existing 19” rack cabinets. Flexible back-up times: different back-up time configurations are available either within the UPS standard cabinet or by using taller UPS cabinets, without changing the floor space (W = 444, D = 795 mm). Power and availability (redundancy) can be extended by placing up to 2 units in parallel. Combi Concept: BC108 and BC110 models are compatible with single or three phase inputs, which can be configured during installation. Fitted with an alphanumeric LCD display. Protection against back feed on the upstream network (internal or external back feed). Looking for SOCOMEC UPS ?